Recently, a documentary detailing the frivolous job of Anna Wintour releasing the thickest issue on Vogue's calendar has been released. Nonetheless, entitled as The September Issue. US Vogue editor Anna Wintour's desk has not slipped every design lover's scrutinizing eye. Click "Read More" to read how the public sees the "Devil's" take on vogue desk. We were most surprised by the fact the workspace decor seems warm and almost welcoming; not the feeling one would expect of the notoriously demanding editor's office. 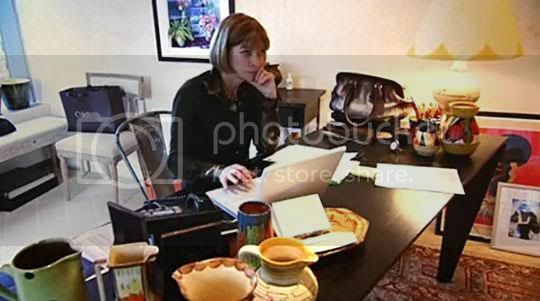 I’ll just come out and say it–I am taken aback by the state of Anna Wintour’s office. Yes, I expected it to be artfully messy and all that. And I expected the Queen of All Sylphs to have a seat that sacrificed comfort for aesthetics. 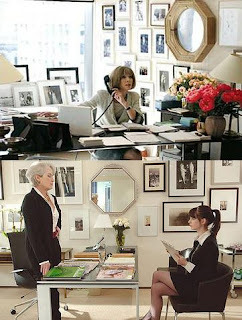 What we might not know is that Anna Wintour's office looked a lot more interesting until "The Devil Wears Prada" came to the box office in 2006. Now Wintour has redecorated to erase any similarity, a Vogue spokesman confirmed Wednesday. We definitely want the old Anna Wintour space.